Seen as a laptop alternative we do find the Galaxy Book's keyboard cover/stand overly fussy, plus its trio of positions isn't exactly flexible. This, plus its not-so-bright screen, hold the Galaxy Book back from being exceptional. But for £650 all-in, it's got plenty of positives for its well-considered price — and given that many £1,000+ competitors can't even last half a day, Samsung's more affordable approach makes plenty of sense. In recent times the promise of post-PC era in 2-in-1 form seems to have been somewhat dashed by the creeping high price points of devices like the Microsoft Surface Pro or Lenovo Miix 720. It was only a year ago that we were calling out the £849 Samsung TabPro S as being to excess. A lot can happen in a year in tech, though. So while we've seen Microsoft pushing prices up — even its lowest config 2017 Surface Pro is pushing close to £1,000 once you add a keyboard — Samsung has gone the other way in the £649 Galaxy Book, which should be seen as the more affordable and spiritual successor to the TabPro S.
Well, that's the case if considering the 10.6-inch model, as reviewed here, because there's also the 12-inch model with more screen resolution and core power which, unsurprisingly, costs considerably more cash. The 10.6 should't be ignored, however, as its more accommodating spec, solid battery life, keyboard and stylus inclusion in the box and fair price point make it well worthy of attention. Problem is, just as with the TabPro S, the Samsung Galaxy Book can't quite cut it in every dimension — the design isn't a patch on the Surface Pro, the keyboard is plasticky and has an overly fussy stand design — which might make you think twice before buying what otherwise appears to be a well priced Windows 10 2-in-1. There's a sense of one step forward one step back in the Galaxy Book. It wants to be a laptop alternative, but only has one USB Type-C port — which also doubles-up as the charging port — so can't compete with a similar spec Surface Pro and its full-size USB port in this regard. While other makers are doubling down on ports, this Samsung straddles the tablet-laptop fence and, in a sense, falls more onto the tablet side. However, the Galaxy Book does come complete with both Island Type keyboard and S Pen stylus in the box, which sees every base covered without additional expense. So as a complete off-the-shelf device, that makes it rather well priced. But to include such kit, the quality isn't 100 per cent premium — the keyboard is plasticky, which is more a visual issue than a practical one, as it feels just fine to type on. The keyboard also acts as the tablet's cover and stand. But it's not a kickstand, it's more DIY origami stand, which can be positioned in one of (according to the diagram) three ways to suspend the screen at a rigid angle (two of them seem the same as one another arranged in different ways to us). The Galaxy Book introduces a magnet to be used for the steepest stand position, which makes it easy to get things into place. We'd much rather have a solid, infinitely adjustable stand though. In a laptop sense this stand formation isn't very practical to use when on the go. It's too bunched together to sit properly on the lap, so we always felt like it was all going to fall apart with too many bumps when on a train journey. Pop it onto a desk and its quite the opposite: the plastic pad is rigid, so there's not excessive flex, while the gaps between the keys make for a more defined typing experience this time around (the TabPro S keys were zero spaced). Overall, then, the Galaxy Book is a bit of a mixed bag when considering its design credentials. It looks and feels very much like a relatively thick 10-inch tablet with a keyboard add-on, rather than a comprehensive laptop alternative. It doesn't have the visual design muscle to standout against the likes of the (admittedly pricier) Surface Pro. It is far more affordable than last year's TabPro S, however, which is a big part of the Galaxy Book's appeal. For the 10.6-inch Galaxy Book, Samsung has used a 1920 x 1280 resolution LCD panel, which is the same density as, say, a Full HD TV but with some additional height. Given the Ultra-HD panels creeping into various devices this might sound a little on the low side, but at this scale we really don't find it an issue — Windows 10 Home presents itself with all the resolution that you're going to need, especially when considering the limitations of power under the hood. Surrounding the panel is a fairly chunky bezel, rather than the ultra-trim “infinity” displays of current laptops, but that makes sense on account of using the Book like a tablet. It is touchscreen after all, with a decent response. The included S Pen stylus functions perfectly well here, too, although a lack of anywhere to store it is a nuisance. The thing that mildly disappoints about the screen is its maximum brightness. It's not dim, but positioned side-by-side next to our aging MacBook Air and the Samsung just doesn't have as much zing. It's still bright enough to use outside, though, and because the panel isn't ultra reflective there aren't too many issues with staring back at your own mirrored image while squinting to see what's going on. Pairing this screen with a fairly low-powered Intel Core M3 processor is a savvy move for the 10.6-inch model. It results for a device that's designed for long-term use. Now, a 1.00GHz processor might not sound like much, but it really depends what you want to do with the Galaxy Book. It's not a gaming machine, nor does it pretend to be; it's not going to be as fast as a Core i7 at churning through tasks but, again, it's not purporting to do that. If you want a bit of extra pep then the 12-inch Core i5 option might be more up your street — but it'll cost more and won't last nearly as long per charge. We think the Core M3 is the savvy option. If you're web browsing, watching videos, word processing, emailing and not causing yourself too much drama then the Galaxy Book swims along just fine. Plus, it does so completely silently. Yep, not a single whirr or whistle from this machine, which is a huge benefit. And considering a beast like the Lenovo Miix 720 howls at the slightest of asks, the lower-spec Galaxy Book earns its dues here. Plus, such a processor isn't as power hungry as a fan-cooled one. In terms of longevity, we've found the Galaxy Book to last for a long time per charge. Streaming a 1440p video at full brightness and 50 per cent volume in Edge browser saw the battery dip by 44 per cent in three hours, meaning around seven hours per charge in such a scenario. For perspective: in the same period of time the Lenovo Miix 720 would be almost dead and buried. 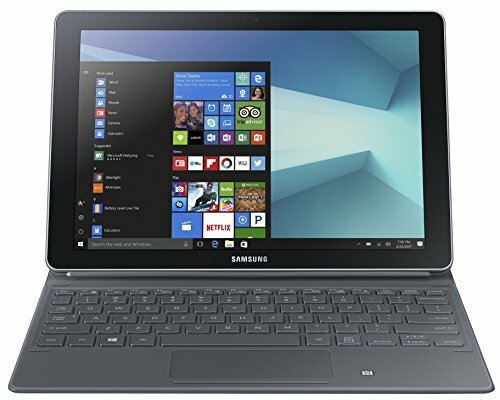 Overall, with mixed use the Galaxy Book can easily last for a full nine hours a day. It's not been uncommon for us to manage double-digit hours when we've been typing and not doing much more than streaming some tunes in the background. When it comes to recharging the USB Type-C port can re-juice the battery in a few hours, which isn't super-fast, but is as expected. That might not matter if you value productivity, though. Sure, the 10.6-inch Galaxy Book isn't ultra powerful, given its Intel Core M3 processor, but it does run silently and for a long time per charge. It's easy to get a full day of work from this Windows 2-in-1. Seen as a laptop alternative we do find the Galaxy Book's keyboard cover/stand overly fussy, plus its rigid positions aren't exactly flexible. This, plus its not-so-bright screen, hold the Galaxy Book back from being exceptional. But for £650 all-in, it's got plenty of positives for its well-considered price — and given that many £1,000+ competitors can't even last half a day, Samsung's more affordable and long-lasting approach makes plenty of sense. The most obvious Windows competitor is the lowest-spec version of Microsoft's latest Surface Pro. Also available in a fan-free Core M bent, the Surface is far better looking, has a better stylus, far better stand, plus is more versatile on account of its full-size USB port. You'll need to pay extra for the keyboard though. We've purposefully not harked on about Apple's tablet throughout this Samsung review - mainly given the vast differences between iOS and Windows 10 - but if you add an optional keyboard to Apple's device then, pound for pound, it's a similar product at a similar price point. Plus, in our view, it looks more attractive. Want more power for less cash? Acer's liquid cooled Switch Alpha 12 is just the ticket. It's got a larger screen and won't cost you as much green.